From the pages of Sherlock Frankenstein comes this horrific tale of Lovecraftian teenage angst. Spawned by the emissary of a Cthulhu god, Cthu-Louise struggles and is teased at school due to her monstrous appearance. Finally fed up with the bullying and abuse, she decides she will do anything to make herself ''''normal.'''' Emi Lenox''s return to the Black Hammer World! 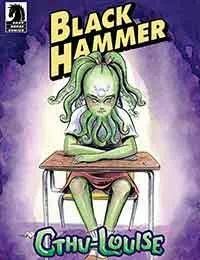 Ties directly into the Eisner-Award winning Black Hammer comic books series and is written by Jeff Lemire.